which required aggressive crown lengthening. Gummy smiles are aesthetically unpleasing. They are caused by short upper lips or a long maxillary alveolar bone due to long roots of the upper anterior teeth. Since the alveolar bone is that part of the skull that harbors the roots of the teeth, the formation of long dental roots coincides with a long alveolar bone. If the philtrum above the upper lip is short and the roots of the upper front teeth are long, a gummy smile may be the result. Misaligned and protruded teeth may aggravate the gummy appearance of a smile. Gummy smiles can be corrected by different treatment modalities. Depending on the cause and the cosmetic dental treatment goal, it can be corrected by orthodontic intrusion of the involved teeth, gingivectomy, or a crown-lenghtening procedure. A gingivectomy is only possible if the patient has a hyperplastic gingiva or sulcus probing depths of more than 3 mm. It is important to evaluate the distance between the crest of the alveolar bone and the gingival margin. Nature establishes a distance of about 3 mm between the osseous crest and the gingival margin. It is called "biological width." If the cosmetic dentist violates this distance and leaves less than 3 mm from the free gingival margin to the crest of the bone, the body may respond with local inflammation and resorption of osseous tissue until the biological width has been reestablished. Orthodontic intrusion is the treatment of choice if the teeth have short roots or if there would be a lack of attached gingiva remaining after the crown-lengthening procedure. 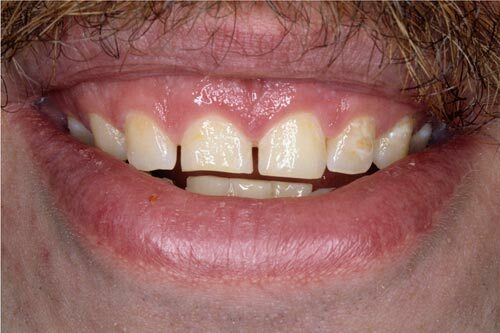 This patient had and asymmetric gumline that was too conspicuous. Her teeth appeared short, misaligned, and timid. Masato Kaku. Gummy smile and facial profile correction using miniscrew anchorage. The Angle Orthodontist. 2012, Vol. 82, No. 1, pp. 170-177. Deepak Chandrasekharan. 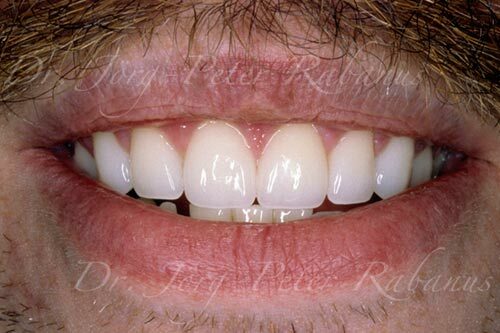 Intrusion of anterior teeth to improve smile esthetics. Journal of Maxillofacial and Oral Surgery. 2010, Volume 9, Issue 1, pp 27-29. Nitin Khuller. Biologic Width: Evaluation and Correction of its Violation. J Oral Health Comm Dentistry. 2009 vol. 3 (1) pp. 20-25. Robert E. Barr. Laser Periodontal Treatment and Surgical Procedures: Part I. Pract Proced Aesthetic Dentistry. 2004 vol. 16 (10) pp. 747-8. Nitzan Bichacho. Cervical Contouring Concepts: Enhancing The Dentogingival Complex. Pract Periodontics Aesthetic Dentistry. 1996 vol. 8 (3) pp. 241-54. Stephen J Chu. A biometric approach to aesthetic crown lengthening: part I--midfacial considerations. Pract Proced Aesthetic Dentistry. 2008 vol. 20 (1) pp. 17-24. Daniela Eilrério. Surgical Crown Lengthening: A 12-Month Study - Radiographic Results. J Appl Oral Sci. 2007 vol. 15 (4) pp. 280-4. Ernesto A Lee. Aesthetic crown lengthening: classification, biologic rationale, and treatment planning considerations. Pract Proced Aesthetic Dentistry. 2004 vol. 16 (10) pp. 769-78. Robert A Levine. The use of periodontal plastic surgery procedures in aiding esthetic restorative results. Compend Contin Educ Dentistry. 2003 vol. 24 (10) pp. 729-34, 736, 738 passim. Robert A Lowe. Cosmetic recontouring of gingival tissues and alveolar bone. Pract Proced Aesthetic Dentistry. 2006 vol. 18 (5) pp. 315-6. Michael S Reddy. Achieving gingival esthetics. J Am Dental Association. 2003 vol. 134 (3) pp. 295-304. S Studer. The aesthetic guidelines of the mucogingival complex for fixed prosthodontics. Pract Periodontics Aesthetic Dentistry. 1996 vol. 8 (4) pp. 333-41. Douglas A Terry. The perio-aesthetic-restorative approach for anterior reconstruction--Part I: Evaluation and periodontal surgery. Pract Proced Aesthetic Dentistry. 2002 vol. 14 (4) pp. 283-91. V J Ward. Surgical Crown Lengthening. British Dental Journal. 1999 vol. 187 (1) pp. 21-24. G Richard Young. Esthetic rehabilitation in the compromised anterior maxilla. Cont Esthet Rest Pract. 2003 vol. January pp. 20-33. Babitha Nugala. Biologic width and its importance in periodontal and restorative dentistry. J Conserv Dentistry. 2012 Jan-Mar; 15(1): 12–17. Lanning SK. Surgical crown lengthening: evaluation of the biological width. J Periodontol. 2003 Apr;74(4):468-74.